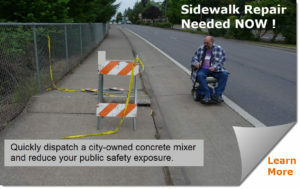 For about 10-years the City of Salem has used a Cart-Away Mixing Trailer to assist them in completing their sidewalk repairs. This effort is a part of a long-term community plan. 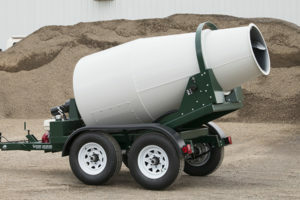 Using a concrete mixing trailer is not a new concept for the city. They started using one of these mixers that they rented from a local rental company before they decided to purchase a unit of their own. About 10-years ago the city formed a dedicated sidewalk crew and used the Cart-Away trailer to support the team. Today a crew breaks out the damaged sidewalk panels and prepares the site with compaction and forms in the morning. Then they bring in the mixing trailer pulled behind a city truck. The mixer comes to the job-site full of mixed concrete and ready to pour into the forms. The crew then finishes the concrete while the truck with the mixer returns for more concrete or goes off to service another pour somewhere in the city. Many municipalities choose to own their own loading system to fill the raw materials into the mixing trailer. In Salem they have an arrangement with Herc Rentals for the material loading. The rental yard has an automated loading plant and a cement silo that fills a trailer with the necessary raw materials in two-minutes. 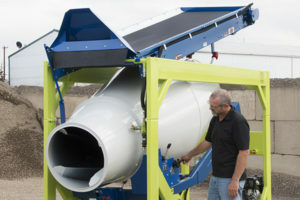 There are hundreds of communities around the country that have these small batching centers to load the mixing trailers with sand, gravel, cement and water to make concrete. In areas where there is not a loader, the cities get their own batch equipment and fill their own trailers. 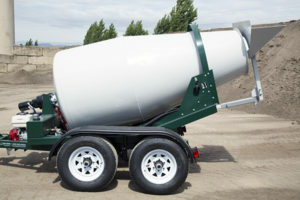 Cart-Away provide various loading methods that support the concrete mixing trailer. 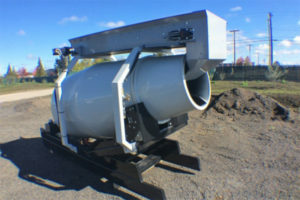 The city of Salem used their first 1-yard mixing trailer almost everyday for about 7-years before deciding to trade-in and upgrade the mixer. In 2015 they moved up to the 1.75-cubic yard MixKing trailer with the optional on-board water system – PortaWash. The city received a significant increase in capacity with the larger trailer while adding the opportunity to do clean-out quicker. 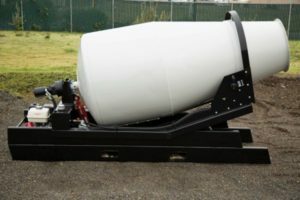 The city crew has increased efficiency and the community is getting safer sidewalks thanks to the Cart-Away mixing trailers.